I thought I would whip up something that just screamed summer. A light and creamy first course. 1. Peel seed the cucumber. 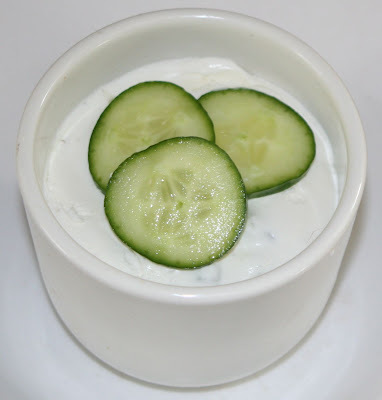 Cut the cucumber into 1/4 inch cubes and sprinkle with the salt. Place in a colander and allow the cucumber to sweat for at least 30 minutes. Place the sweated cucumbers into paper towel and squeeze to remove any remaining liquid. 2. In a stand mixer, whip the fromage blanc and the sour cream. 3. Boil the water, remove from stove and add in the gelatin, stirring until dissolved. Add the warm gelatin to the fromage blanc mixture, then fold in the drained cucumbers, chives and lemon juice. Allow the mixture to sit for 30 minutes to thicken. 4. 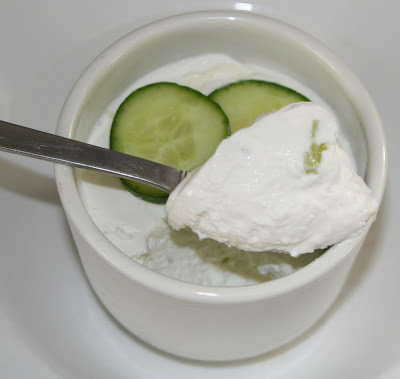 Whip the heavy cream into stiff peaks and fold into the thickened fromage blanc/cucumber mixture. Spoon into ramekins or small glasses and refrigerate for at least 2 hour. To serve, garnish with thin slices of cucumbers.